Paramedic Abdullah Qatati, 22, and Ali al-Alul, 55, were killed by Israeli live fire during last Friday’s protests along the eastern borders of the Gaza Strip, while Ahmad Abu Luli, 40, succumbed on Saturday morning to wounds he sustained a day earlier. 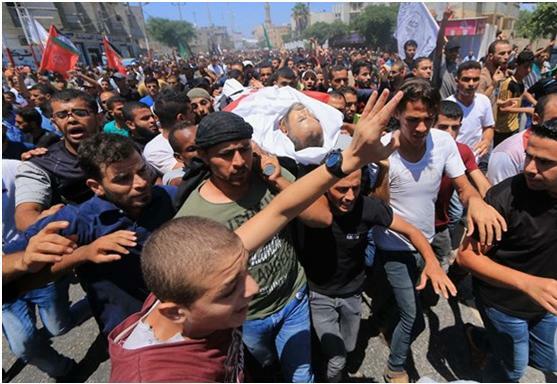 The three funeral processions set out from the Abu Youssef Najjar Hospital in Rafah in the southern Gaza Strip. In addition to the three Palestinians killed, another 307 persons were reported by the Ministry of Health in Gaza to have sustained injuries during the August 10 demonstrations as thousands of marched along the eastern border of the blockaded enclave to participate in marches conducted under the slogan “Friday of Freedom and Life.” They called for an end to the nearly 12-year Israeli siege of Gaza by Israel. News of the death of Ahmad Abu Luli on Saturday appeared on the front pages of three Arabic Palestinian dailies on Sunday. The newspapers added that an Israeli reconnaissance aircraft fired at three different locations east of Gaza on Saturday, injuring at least five persons and that Israeli ground forces shot and wounded four Palestinians during clashes that erupted after the army raided the town of Beit Ummar near Hebron in southern West Bank.